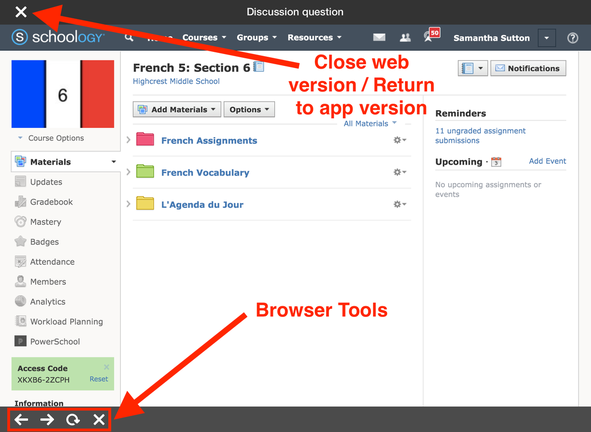 You can access this option using your Schoology iPad app either through a discussion or an assignment. 1. Open a discussion and remain on the "INFO" tab. 2. Tap on the 3 dots that appear in the top-right corner, then select "View Web Version"
3. The web version of Schoology should then appear. Browser tools like "go back/forward", "refresh", and "stop loading" are on the bottom-left side of the screen. To return to the app version, tap on the "X" that's in the top-left corner of the screen. 1. Open an assignment and remain on the "INFO" tab. 2. Tap on the box with an arrow that appear in the top-right corner.